In 1963, the United States Air Force began to look for a very big plane to transport things. At that time, they were using the Lockheed C-141 Starlifter. However, the Air Force thought that a much bigger plane which could carry more cargo was needed. The Air Force called the big plane the CX-Heavy Logistics System (CX-HLS). It needed to be able to carry 180,000 pounds (81,600 kg) of cargo and travel at Mach 0.75 (500 mph or 805 km/h). It also had to be able to fly for 5,000 nautical miles (9,260 km) while carrying 115,000 pounds (52,200 kg) of cargo. The cargo bay had to be 17 feet (5.18 m) wide, 13.5 feet (4.11 m) high and 100 feet (30.5 m) long. There had to be doors for the bay at the front and the back of the plane. Planes as big as the 747 needed high-bypass turbofan engines. High-bypass turbofans can produce twice the power of turbojets, and also use a lot less fuel. General Electric made the first of these engines. However, it was making the engines for the C-5 Galaxy. It did not make engines for airliners until later. Pratt & Whitney was also working on this type of engine. In 1966, Boeing, Pan Am and Pratt & Whitney designed a new engine, the JT9D, for the 747. Designing the 747 and building the new factory cost a lot of money. This meant that Boeing had to borrow a lot of money from a bank. Just before the first aircraft was finished, Boeing had to keep asking for more money. If Boeing was not given this money, the company could have collapsed. Boeing was in over $2 billion in debt. Allen said, "It was really too large a project for us. ":303 However, the 747 program was a success. Boeing was the only company to make very big planes for many years. The recession of 1969-1970 was very bad for Boeing. For over a year after September 1970, it only sold two 747s. None were sold to an American airline for over three years. :302 Some airlines did not have enough passengers to fly the 747. Therefore, they replaced them with the McDonnell Douglas DC-10 and Lockheed L-1011 TriStar. American Airlines eventually only used its 747s to carry cargo. In 1983, AA gave its 747s to Pan Am. Pan Am gave American Airlines some smaller planes. Delta Air Lines also stopped using its 747s after many years. Delta would later merge with Northwest Airlines, which operates 747s. The 747SP (SP means special performance) is designed as Pan Am and Iran Air both wanted a wide-body plane that can fly long distances; from New York to the Middle East (for Pan Am) and Tehran to New York (for Iran Air). 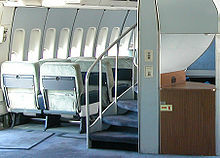 The first 747SP was produced on 19 May 1975. Its first flight was on 4 July. On this flight, it flew at a top speed of Mach 0.92 (1,127 kilometres per hour or 700 miles per hour). It started flying people on 25 April 1976, after being delivered on 5 March. Now, it is not often used. A total of 45 747SP were made and used by airlines like Qantas, China Airlines, Air China, and South African Airways. The 747-400 was the next-generation Boeing 747 introduced in 1989. It is the best-selling variant of the Boeing 747. It includes improvements over the 747-300 including new engines, and new winglets, which improve fuel efficiency. Its length is the same as the 747-300 but the wingspan has been increased to 211 feet 5 inches. The 747-400 retains the same a longer upper deck as the 747-300 (excluding frieghter versions), and came in six variants: the 747-400, 747-400F, 747-400M, 747-400D, 747-400ER, and the 747-400ERF. The most recent variant of the Boeing 747 was announced in 2005 and released on 2011. It includes a longer stretched upper deck, a new Boeing Sky Interior, an updated flight deck, new wings based on ones from the Boeing 787 Dreamliner, and new GEnx turbofan engines. It totals 250 feet in length, making it the longest commercial passenger jet ever built. The 747-8 comes in two variants: 747-8I and 747-8F (freighter). ↑ 1.0 1.1 1.2 1.3 1.4 1.5 Rumerman, Judy. "The Boeing 747." U.S. Centennial of Flight Commission, 2003. Retrieved: April 30, 2006. ↑ 2.0 2.1 2.2 "Boeing 747 family -- The right choice for the large aircraft market. "retrieved 7th November 2013. ↑ "Boeing Commercial Airplanes prices." The Boeing Company. Retrieved: August 8, 2012. ↑ Branson, Richard. "Pilot of the Jet Age." Time, December 7, 1998. Retrieved: December 13, 2007. ↑ "A380 superjumbo lands in Sydney." BBC, October 25, 2007. Retrieved: August 3, 2010. Quote: "The superjumbo's advent ends a reign of nearly four decades by the Boeing 747 as the world's biggest airliner." ↑ Haenggi 2003, pp. 14–15. ↑ "Technical Characteristics – Boeing 747-400", The Boeing Company. Retrieved: April 29, 2006. ↑ 11.0 11.1 11.2 Norton 2003, pp. 5–12. ↑ 12.0 12.1 Norris and Wagner 1997, p. 13. ↑ 17.0 17.1 Noland, David. "Passenger Planes: Boeing 747." "Info please." (Pearson Education). Retrieved: April 30, 2006. ↑ "Lockheed C-5 Galaxy, Partners in Freedom." NASA, 2000. Retrieved: December 17, 2007. ↑ Irving 1994, p. 282. ↑ 21.0 21.1 21.2 Sutter 2006, p. 93. ↑ Jenkins 2000, p. 17. ↑ Mecham, M. "In review: 747, Creating the World's First Jumbo Jet and Other Adventures from a Life in Aviation." Aviation Week and Space Technology, Vol. 165, No. 9, September 4, 2006, p. 53. ↑ "GE Aviation: CF6." GE Aviation. Retrieved: December 9, 2007. ↑ 25.0 25.1 Colson, Michael S. "Mechanical Engineering 100 Years of Flight." memagazine.org. Retrieved: December 9, 2007. ↑ Guy and Wagner 1997, pp. 25–26. ↑ Jenkins 2000, p. 19. ↑ Sutter 2006, pp. 96–97. ↑ Guy and Wagner 1997, p. 19. ↑ 31.0 31.1 "Major Production Facilities – Everett, Washington." The Boeing Company. Retrieved: April 28, 2007. ↑ "747 Milestones." The Boeing Company. Retrieved: December 17, 2007. ↑ "History – "747 Commercial Transport." The Boeing Company. Retrieved: April 29, 2006. ↑ "Boeing 747, the "Queen of the Skies," and "Celebrates 35th Anniversary." The Boeing Company, February 9, 2004. Retrieved: December 17, 2007. ↑ Irving 1994, pp. 441–446. ↑ "The Trouble with Jumbo." Time, September 26, 1969. ↑ Aircraft Incident Report 5-0046 National Transportation Safety Board, August 20, 1970. Retrieved September 26, 2011. ↑ "The Paris Air Show in facts and figures." Reuters, June 14, 2007. Retrieved: June 3, 2011. ↑ Irving 1994, pp. 437–438. ↑ 45.0 45.1 Heppenheimer, T. A. (1998). The Space Shuttle Decision. NASA. ↑ "Jumbo challenge" Flightglobal.com, November 6, 1997. Retrieved: July 15, 2011. ↑ "Jumbo and the Gremlins." TIME, February 2, 1970. Retrieved: December 20, 2007. ↑ "Breaking the Ground Barrier." TIME, September 8, 1967. Retrieved: December 19, 2007. ↑ "Jumbo Beats the Gremlins." TIME, July 13, 1970. Retrieved: December 20, 2007. ↑ "Ready or Not, Here Comes Jumbo." TIME, January 19, 1970. Retrieved: December 19, 2007. ↑ Smith, Bruce A. "Boeing Shuns Very Large Jets While Aiming for Longer Range." Aviation Week and Space Technology, January 1, 2001, pp. 28–29. ↑ 747X vs A380 "How to Reduce Congestion (PDF)." Department of Aerospace and Ocean Engineering, Virginia Tech. Retrieved: December 10, 2007. ↑ "Planes for Rough Weather." TIME, August 3, 1970. Retrieved: December 20, 2007. ↑ "American Airlines History." American Airlines. Retrieved: June 3, 2011. ↑ Davies 1990, p. 96. ↑ "Aircraft Fleet." Delta Air Lines. Retrieved: July 31, 2011. ↑ "Turning Today's Challenges into Opportunities for Tomorrow." The Boeing Company. Retrieved: December 10, 2007. ↑ Aboulafia, Richard. "Commercial Transport Market Still in Rough Shape." Aviation Week and Space Technology, March 1, 2004. Retrieved: December 10, 2007. ↑ 60.0 60.1 "Boeing 747 Classics." The Boeing Company. Retrieved: December 15, 2007. ↑ "Solutions Center." The Boeing Company. Retrieved: December 13, 2007. ↑ "Boeing 747SP." Airliners.net. Retrieved: November 23, 2007. ↑ "Aircraft Owner's and Operator's Guide: 747-200/300 (PDF). "Aircraft Commerce. Retrieved: July 15, 2011. ↑ "Boeing 747-300." Airliners.net. Retrieved: June 3, 2011. ↑ Salpukas, Agis. "J.A.L. Orders 15 More of Boeing's 747-400's." Time, July 1, 1988. Retrieved: December 17, 2007. ↑ Norris 1997, p. 88. ↑ "El Al History page." El Al Airlines. Retrieved: October 18, 2007. ↑ "Ask Us – Largest Plane in the World." Aerospaceweb.org, November 11, 2005. Retrieved: April 29, 2006. ↑ 70.0 70.1 "Boeing Outlines the "Value" of Its 747 Plans." The Boeing Company, September 2, 1996. Retrieved: June 7, 2011. ↑ "BA warms to A3XX plan." Flight International, March 19, 1997. Retrieved: December 17, 2007. ↑ "Boeing Shelves 747X to Focus on Faster Jet." People's Daily, March 30, 2001. Retrieved: December 17, 2007. ↑ Taylor, Alex III. "Boeing's Amazing Sonic Cruiser..." Fortune, December 9, 2002. Retrieved: December 17, 2007. ↑ "Boeing Launches New, Longer-Range 747-400." The Boeing Company, November 28, 2000. Retrieved: December 17, 2007. ↑ "A380 superjumbo lands in Sydney." BBC News. Retrieved: December 10, 2007. ↑ "Boeing Launches New 747-8 Family." The Boeing Company, November 14, 2005. Retrieved: December 17, 2007. ↑ "Downhill for the jumbo." The Sydney Morning Herald, January 9, 2009. Retrieved: February 9, 2009. ↑ Ostrower, Jon. "Boeing's 747-8F lifts off on maiden flight". Flightglobal.com, February 8, 2010. ↑ "Boeing Sets 747-8 Freighter Delivery Schedule for Mid-Year 2011". The Boeing Company, September 30, 2010. ↑ Trimble, Stephen. 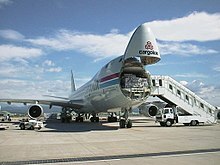 "Boeing pushes 747-8F delivery back to mid-2011/" Air Transport Intelligence News via flightglobal.com, September 30, 2010. Retrieved: February 22, 2011. ↑ "Airbus A350 XWB puts pressure on Boeing 777." Flight International. November 27, 2007. ↑ Bowers 1989, p. 508. ↑ "Boeing 747-100/200/300 Technical Specifications." The Boeing Company. Retrieved: December 13, 2007. ↑ "Boeing 747-8 Technical Specifications." The Boeing Company. Retrieved: December 13, 2007. ↑ Sutter 2006, pp. 121–122. ↑ "Special Report:Air India Flight 182." airdisaster.com. Retrieved: December 13, 2007. ↑ "Her Majesty the Queen Against Ripudaman Singh Malik and Ajaib Singh Bagri." Supreme Court of British Columbia. Retrieved: December 13, 2007. ↑ "ICAO Document 8643." International Civil Aviation Organization. Retrieved: April 13, 2013. ↑ "Boeing 747." Aircraft Spotting. Retrieved: December 7, 2007. ↑ "FAA Regulatory and Guidance Library (PDF)." FAA. Retrieved: December 12, 2007. See reference to Supplementary Type Certificates for freighter conversion. ↑ 91.0 91.1 "Boeing: 747-8". www.boeing.com. ↑ 92.0 92.1 "Boeing: Technical Specificaions -- 747 Classics. "retrieved 7th November 2013. ↑ "Airliners.net". Airliners.net. Retrieved 2018-02-27. Wikimedia Commons has media related to Boeing 747.